Our apartment is a first floor apartment (not ground) it has 3 rooms and a balcony. It has a nice bed room with queen size bed,a fully equiped kitchen. the living room has a big window from the ceiling to the floor. It has a big sofa that can easily use as a bed. 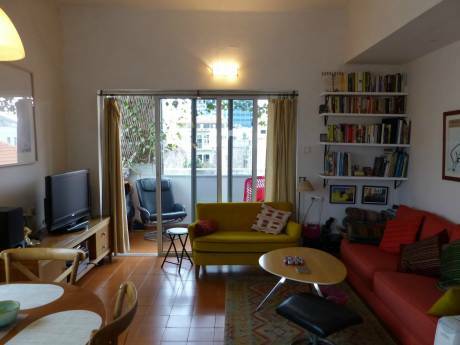 There is allso a big flat t.v screen with cable connection and d.v.d (allso with internationl channels) the living room is atached to a small and very beautiful balcony with a nice view to one of Tel Aviv's most pituresque street. In addition, there is a computer room with fast internet connection with a very big desk. In general, the apartment is very clean and well kept. And the neighbors are realy warm and helpfull when needed. **if requested there is allso a subterrain parking place. Our neighbourhood is located in the middle of the historical (and the current) center of Tel Aviv. 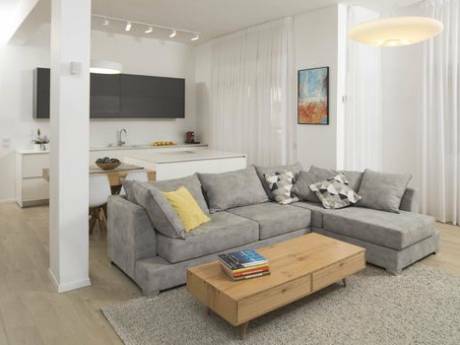 It is without a doubt one of the best places you would want to stay in on a vacation in Tel-Aviv. Our building is a renovated "bauhaus" building placed in the corner of rothschild boulevard and a small pedestrian street. The building is surrounded by trees. (durring summer the bloom of the sycamore trees makes the street look like a huge bouquet) next to the entrance of the building there is a small garden with banches and a fountain. Every thing you need is in short distance: *the shopping center of Tel aviv(shenkin street-50 m) *24/7 super market. *Cinemas *many restaurants of all kind and prices. *fast public transportation to the beach. *plenty of clubs opend untill late. *this is a very tolerant neighbourhood. There is a jewish orthodox comunity here and allso a big gay and lesbian comunity.